What are the new interior design trends of 2018? At Shuttercraft we’ve put together some of the latest interior trends that we think will really take off in 2018. Although trends will likely change as the year goes on, we’re sure that shutters will still be the window covering of choice by the start of 2019. Updating your furniture and fixings can make a real difference in your home, and breathe new life into your home. There are materials, colours, fabrics and themes becoming more and more popular that you may wish to consider for 2018. 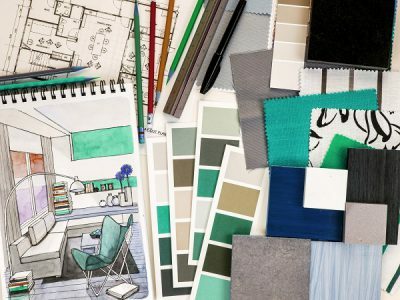 Whether you’re thinking of investing in new tables or chairs, flooring or window coverings such as shutters, it is important to consider design trends that will last, helping you enjoy your living space for years to come. If you really want an effective room transformation in 2018, why not book a free home appointment with your local Shuttercraft and let your windows breathe new life into your space. What’s going to be hot in 2018?? If you are considering new home décor for 2018, then there are a few simple techniques to really make your property stand out from the crowd. Although contemporary designs are still defined by plainer walls, brighter shades such as a vivid Red or Ultra Violet (Pantone’s Colour of the Year) provide a great stylistic counterpoint. 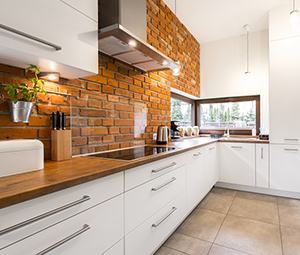 Rather than plainer metals such as stainless steel or brushed nickel, a home can really come to life with materials that have a warmer colour to them. One of the key trends for kitchens in 2018 is combining different materials and tones. A more contemporary minimalist style can look fantastic but isn’t always practical in kitchens. Put simply, white surfaces get dirty quickly! Marble, tiles, and wood are all back on trend, and provide a good choice for the kitchen. Everyday items such as tables, flooring, and bannisters can really stand out with a classic wood finish. Solid panel shutters are a great window treatment idea for living rooms, and are once again gaining popularity among architects. Wood is a material that just keeps on giving. 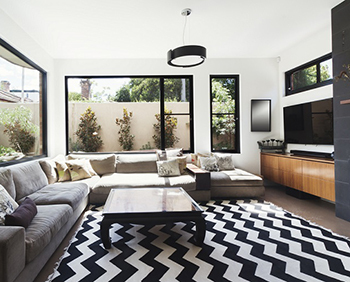 Bold shapes in black and white are coming back in for both designers and homeowners alike. Particularly popular for tiled flooring in Victorian townhouses, this trend now also extends to zig zag rugs, furniture and even window coverings. These provide fantastic views for properties in more secluded locations, just as by lakes or wooded areas, although may not be as effective for a smaller inner-city home! Letting large volumes of light in, large feature windows sound great, but quickly can fade your furniture due to the bleaching effect of the sun. Therefore, it is important to think about window treatments like shutters which can temper the light when closed, or bi-fold out of the way when needed. Above all, when exploring the home design trends 2018 has to offer, think about the shapes and colours that you enjoy the most. Being on trend is a great plan if you’re thinking of moving and want to upsell your property, but it may not be the most practical solution for every day practical living. Although a stylish choice, an open space is not suited to everyone’s needs. If you are in a new property and want to close up the space, there are choices such as shutters to divide rooms to help you get the design just right. Keeping your home looking stylish for the New Year is not just a case of looking for new additions, it is also a case of recognising which decorating trends are out. Your property may feature some of the design trends from years gone by, so what better time to spruce up your living space and bring it up to date! Giving your home a holiday feel all year round, features such as rope, driftwood, portholes and model boats are on the way out as tastes change among interior designers. Borders can be an eye catching way to help split up two different shades on a wall, and for a time were also popular to emphasise the divide between wall and ceiling. However, wallpaper borders are now being phased out in favour of clean walls and plain colours. Due to the natural finish of the wood, pine has been a popular material for many years. Although it provides a classic look, this particular grain (and cheaper alternatives that just give the appearance of pine), are being phased out in favour of alternate materials. As nominated by Elle’s Décor website, vertical blinds are seeming more and more outdated. Although the height of window fashions for many years, these solutions are difficult to operate, clean, and rattle about with even the lightest breeze. Trends such as “popcorn ceilings”, lace table cloths, textured wallpaper and ruffled bed skirts were popular for many years, but eventually fell out of fashion. Why not revisit your home design this year, change your style or invest in different window coverings to really breathe new life into your interiors! Although interior design trends may change from year to year, it is always satisfying to keep updating your home, taking advantage of the latest contemporary looks and reflecting your own changing tastes. Although not a practical choice for every home, plain glass one of the more interesting 2018 home decorating trends. Stylish for modern apartments with a minimalist style, having no window covering at all seems very metropolitan, although is not ideal for properties which are overlooked by others. With no light control, the sun can also prove blinding when at its fullest, and there is no protection from the cold or nearby street lights. Venetian blinds continue to be popular, especially in classic wood grain finishes, tying in well with one of 2018’s other returning trends. Timeless in design, Venetians are designed to block out light when closed, and have a number of safety features to ensure they work in almost any environment. Maybe we’re a little biased, but one of the other solutions that continue to be popular are stylish window shutters. 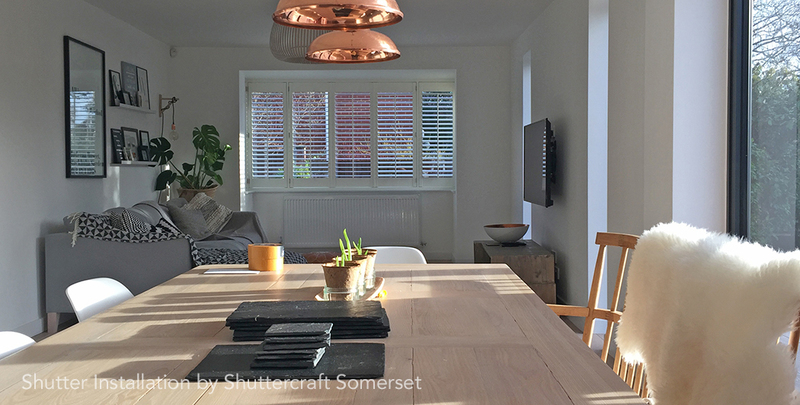 Available from your local Shuttercraft in a number of shapes, sizes, colours and styles, shutters complement a broad variety of interiors, and can really make a home stand out. The clean lines of shutters make them fantastic for creating a contemporary look, as well as maximising space and adding both privacy and light control. Keeping up with interior trends isn’t just to find the latest style, it is a way of helping keep your home up to scratch in case you decide to sell. Every year designers are recommending a number of changes, which may not be to your taste, and may be out of fashion again just 12 months later, so it is important to pick a style that works for you and will last. Without a drastic overhaul of your living space, by simply choosing one of the latest window dressings you can make a significant impact in your home. Shuttercraft help you choose a shutter style to make your house sparkle for 2018 and beyond!